A brain-computer interface has been developed by the US Defence Research Projects Agency (DARPA) that is capable of laying a heads-up display over a user’s natural vision. 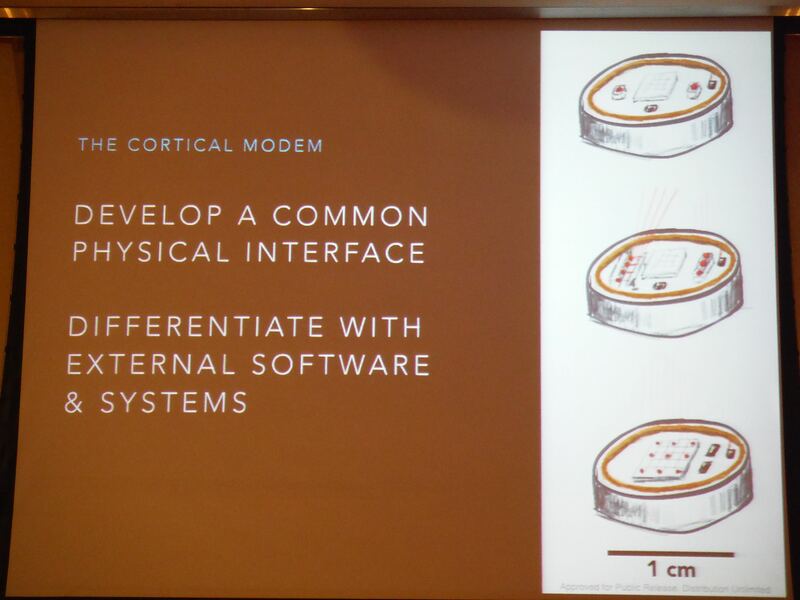 The „cortical modem“ also holds the potential to cure sight loss and enable „electronic telepathy and telekinesis“ according to noted futurist Peter Rothman, writing for H+ Magazine. While still a long way from production, the direct neural interface (DNI) chip would be shaped like a coin, around 1cm wide, and could conceivably cost as little as $10 (£6.50). As outlined at the Biology is Technology conference in Silicon Valley last week, the interface provides a direct link between the brain and an external device or software through manipulation of the visual cortex. Phillip Alvelda, chief of DARPA’s Biological Technologies, told the conference how the device could replace all virtual reality glasses, such as the Oculus Rift, by bypassing the visual sensory system entirely. Elektrische Implantate können Gelähmten helfen, ihre Beine wieder zu bewegen – doch sie wurden bisher vom Körper regelmäßig abgestoßen. Jetzt haben Forscher an Ratten ein neues Material getestet, das womöglich jahrelang im Körper bleiben könnte.